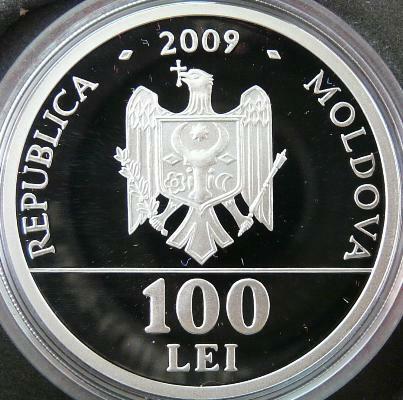 year 2009, circular inscription REPUBLICA MOLDOVA meaning "REPUBLIC OF MOLDAVIA" and the coat of arms of the Republic of Moldavia, in exergue denomination "100 LEI" image of a Middle Age chronicler seated on a back chair, left hand seated on a book kept in his lap, a quill pen in right hand, inscriptions LETOPISEŢELE MOLDOVENEŞTI and secolele XV-XVIII meaning "MOLDAVIAN CHRONICLES" and "centuries 15-18"
The event Moldova 650 was celebrated by the National Bank of Moldavia through the issue of a special anniversary set comprised by 4 values (church of Căuşeni, Codex of Vasile Lupu, Moldavian chronicles and Moldavia 650). 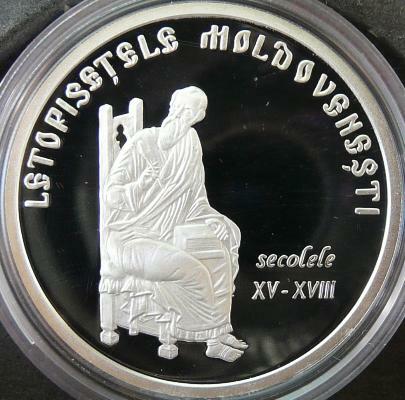 The first Moldavian chronicles, from the 15th and 16th centuries, were written in Slavic. So are the chronicle of Bistriţa, chronicle of Putna, Macarie's chronicle, Eftimie's chronicle and the one of Azarie. Grigore Ureche was the author of the first preserved chronicle in Romanian. His work was continued by chroniclers Miron Costin and then Ion Neculce. Eustratie the Logothete had written a chronicle before Ureche. Other lesser chroniclers were Nicolae Costin (son of Miron Costin) and Axinte Uricarul. Chronicles exist also the authors of which stay unidentified. Due to their precedence and also to their literary talent, the Moldavian chroniclers are an important topic in the study of Romanian literature also even today, the value of their work overcoming both the historical and the literary value of the Walachian chronicles, for instance.